Disclaimer: If you’ve never had a dog this may not be a meaningful post to read. If you have I apologize if it makes you sad. My wife and I recite this to one another before just about every trip when we’re trying to get out the door to go off on whatever our next family adventure will be and we are endlessly waiting for the kids or each other. It is one of the most true statements about travel. Except when it comes to dogs. For the past 14 years, Jessi and Lincoln have been my companions on the journey of life. The picture above was taken just before our first anniversary (when Lincoln would have been a little over a year old), as we set off for a new adventure in Colorado. 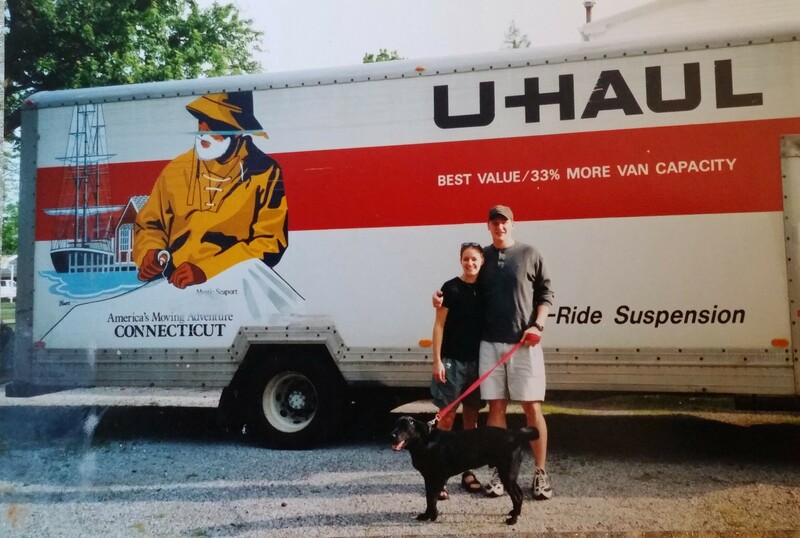 Lincoln rode all the way to Colorado Springs from Cookeville, TN in the cab of that U Haul truck with us and continued to ride along for every twist and turn of life after. All along, we never had to wait on him as a companion, he was always ready to leave today! Lincoln went to the top of 14,000 foot mountains with us and he slept in canyons with us. He tolerated us bringing another dog home to join him for awhile, and he was the one that stuck around when Landon went to live at the farm. He was there when we brought both of our children home, loving them with the same kindness and gentleness that he loved us. He was wagging his tail and greeting us at the door nearly every day, and he was lying by our side consoling us during some tough times. He’s lived with us on a farm where he could chase cows, in an RV where he was the “camp dog,” in a 750 sq ft shack that we called home base, and in every house we’ve ever owned. He’s snuggled up with us in a tent and in the car when the tent got too cold. He’s been on 10 mile hikes and mountain bike rides and was still up for a slow walk around the block on his last day. We got Lincoln from the Putnam Co. (TN) Animal Shelter in March of 2001, just a few months before we were married. In the first few months of his life he did what puppies do – chewed everything in sight, had accidents all over the house, ran away every time we opened the door, jumped out the window of a moving car, and generally taught us that raising a puppy was not a task to be taken lightly. And he went everywhere with us. We were young and adventurous and he was our companion on the journey. No matter what changes life has thrown at us, Lincoln was up for them all. He taught us the skills we needed to continue the journey with children, that’s for sure. We didn’t know it at the time, but walking a lab through the woods is pretty much the same thing as walking a child through the woods. Sometimes they run ahead and sometimes they lag behind. Occasionally they’ll walk right beside you and you feel like all is right with the world. And you’d better have plenty of water with you at all times, because they get thirsty. If only we could get our kids to hike ceaselessly without complaining like Lincoln! Yesterday we had to say goodbye to our old friend. Time had taken its toll on Lincoln. His old legs weren’t up for any hikes and his eyes and ears couldn’t see and hear anymore to find things to chase and bark at. Although his body had started to deteriorate, our buddy stayed on the journey with us. He was still at the door wagging his tail and laying at our feet for a pet when things got tough. He loved his family and we loved him to the very end.